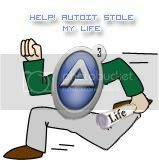 Install a .exe though Autoit? And on FileWrite I just write the hex code of the exe. Or do you have a better solution/way? But this need a sorce first. What I need is I can put the exe in my script, and when I run it, it will unpack the .exe and install it. I don't know... What if a computer without internet, try download it? So can they don't use my program . What if gas prices go up? So you don't drive anymore ? Ask yourself a question... If they don't have internet, how did they get your "program"? The other thing/question you are asking needs to be more specific. What exactly do you need support with? We won't write you a Installer, but there are plenty of examples in the forum of them. Maybe even one to fit your needs .